Hello everyone, and sorry I don't speak Russian. I'm posting this because I know that Evgeni has made many statements about Patrick Chan winning competitions unfairly. I fear that no skater in the world has a chance of winning a competition if Chan is in it because of the politics. As you know, they gave the World title this year to Patrick Chan, when the whole world could see that Denis Ten won. We have a petition asking that a gold medal be awarded to Denis Ten for his performance there. We want the corruption at the ISU exposed. This is not about one person, but about what happens at every competition. saveskating wrote: Hello everyone, and sorry I don't speak Russian. - I must notice, that there was no such actions and petitions in the United States after, by many people around the world, Lysacek's unfair victory at the Olympics 2010 over Plushenko - on the contrary, there was (and still) is ​the whole negative campaign against him in US... quite symptomatic, is not it? We would like to send you our CD, which was nominated for a Latin Grammy a few years ago. My husband is a wonderful trumpet player and he plays Latin Jazz and Rhythm and Blues with many groups that are well known in the USA. I am a vocalist and we were also sponsored by the California Arts Council. Where can I send our album so you can receive it? I do not know if you enjoy jazz or Latin jazz...but I would like you to hear it. Maybe you would enjoy it and find something you like? If not, we just hope you enjoy it. Also, I would like to send you a CD from a group called Tower of Power. They have had many hit songs in the USA for many years and still tour all the time. Right now they are opening for the rock group "Journey" and for the Steve Miller Band on a national tour. They tour all over Europe, Japan, China, Australia, New Zealand and North America. They are an excellent Rhythm and Blues band in the style of James Brown with a fantasic rhythm section and a great horn section. We are big fans of yours and we are cheering you always. We love our USA skaters too...but when it comes to sports (and music) we don't see borderlines of countries. To us, people are people and the best is the best! And you are terrific! We enjoy your performances so much and we thank you for giving us such inspiration. With respect and good wishes to you and your family. It's been a long time I know. *sigh* Lot has been going on this year. Lot of family health crises. Had a lot of stress. But I'm here again! I am gearing up for "NaNoWriMo," "National Novel Writing Month" for those who are wondering what that is. Starting midnight of November 1st, I have until 11:59 PM (23:59) November 30th, to write a novel of 50,000 words or more. I don't have to finish it by that time, I just have to reach that goal of 50,000. This is my 3rd year trying this. My first year, 2011, I won, reaching 51,000+ words. 2012, though, was PATHETIC. I didn't even make it to 20,000. Last year, though, I am proud to say that while I didn't win, I did manage to write 18,000 words on the last day, making a final count of over 48,000! My inspiration was Zhenya. On November 29th, I only had 25,000. I'd all but given up, but I looked at Zhenya... he is my Muse, my greatest inspiration, and I thought, if he can do everything that he has done with his injuries, I can write 25,000 in two days. So that night I wrote 5,000. The next day, I worked hard, taking a few breaks in between (if I'd taken one less break I would have won... but my character Nadya was starting to write herself and was getting on my nerves and that was holding me back...) I wrote the rest. I'm extremely proud of how well I did despite not winning; I could hear Zhenya's voice in my head urging me to go on, to keep fighting through it. My Muse is a man who never gives up, so why should I? Well, despite writing so much, I was not satisfied with how I was telling this story which I have been trying to put into novel form for many years. So I decided to start over in April, for "Camp NaNoWriMo." It's not the real thing, but it is a personal challenge to write 50,000 words in 30 days. I kept having doubts that I could tell this story the way I wanted to, and again I turned to Zhenya for inspiration and encouragement... I had only a few thousand words when my mother had to go to the hospital and nearly died... after that I was too stressed to write. I figured I'd try again in July, but before that happened, I found myself dealing with even more stress. So I figured I would try again in November, when it REALLY counts. I made up the surname for my protagonist. *blush* It is meant as an inside joke, but when and if I actually get it published, I have been advised by Russian friends to change it to a more realistic surname. Until I can think of one or receive suggestions, I'll stick with the one I have, then replace it in the editing process. The story takes place in October of 2001. Evgeni Potemerenko reluctantly moves to America, accompanied by his father, Aleksei. Evgeni is an aspiring but relatively poor figure skater. He was advised to move to America by his coach, Natalya Ignatieva, not for better training or living conditions, but to save himself from a terrible fate at home. Eighteen-year-old Evgeni fell in love with Ekaterina Solovieva, the daughter of wealthy mafiya boss Maxim Soloviev. Soloviev has tried everything he could think of to keep Zhenya and Katya apart, because he felt that his daughter deserved someone wealthier and more worthy than a poor figure skater. After various attempts fail, Maxim simply arranges for Katya to marry another man, Nikolai Borisov, the son of another mafiya boss. Nikolai is very kind to Ekaterina, but the two have no romantic chemistry. Months before the wedding is to take place, Katya sees Zhenya in secret. Eventually, she becomes pregnant with Zhenya's child. Fearing that her parents would disown her, or force her to get an abortion, or worse, that the Borisov family would kill her, Zhenya and Katya plead with her parents to release her from the arrangement. It infuriates Soloviev, who threatens to disown her and throw her out on the streets. Even though Zhenya would have opened his home to her, he knows that losing her family is what Katya wanted to avoid in the first place. He doesn't care what happens to him; he just wants Katya to be happy. So he declares that he raped her. Soloviev throws Zhenya out of his home, and then makes arrangements for him to be kidnapped. He has Zhenya held for three and a half months, during which time Zhenya is starved, dehydrated, deprived of sleep, and brutally tortured, socomized, and raped by his male captors. Soloviev eventually releases Zhenya, after pressure from Natalya's influential mafiya friends beg him to. More than that, Evgeni was starting to go insane, making the tortures not as effective as they were before. Soloviev is vindictive; he woudl rather Evgeni suffer for the rest of his life, than kill him. But there is a condition of his release: He must never go near Katya again. This is an impossible demand for Zhenya, and Aleksei knows it. So it is decided that to ensure his safety, to ensure that he and Katya are kept apart, Aleksei insists that Evgeni move to America, leaving everything and everyone he knows and loves behind in St. Petersburg. 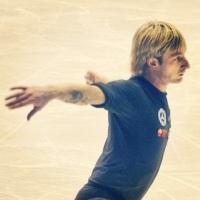 He and his father stay with a close friend of Natalya's, former star skater Liam Collins, who manages a skating tour "Golden Blades." Collins and his family welcome the two with open arms, but soon discover how frail Evgeni is mentally and physically. The reason he was tortured is not yet revealed to them; Aleksei tells them that it must come from Zhenya himself, or he will never trust them at all. It takes a long time for Zhenya to recover mentally and physically to the point where he is ready to start training and get a job. Until that time, he is supported financially by Natalya, who provides everything she can to help him, including physical care. To his heartache, he must miss the 2001-02 Olympic season, so he can take all the necessary time to recover from his ordeal. Aleksei is only able to stay with Evgeni for a few months, and then he must return to St. Petersburg for his job as a teacher at the Kirov Ballet Academy. Liam offers to sponsor Evgeni, paying for all of his skating expenses that the Russian Figure Skating Federation will not cover. He helps him get back on the ice, and offers him a position in the "Golden Blades" tour. Evgeni also gets a job at a local coffee shop. Things seem to be getting better for him, and yet he is still tormented by the memories of his captivity, having panic and anxiety attacks, flashbacks, and nightmares. Seemingly trivial things such as cigarette smoke and the humming of various machines trigger vivid flashbacks. Evgeni will not speak of his experiences to anyone. The only one who is able to truly comfort him is his father. Liam repeatedly suggests that Evgeni seek out a therapist, but for several reasons, Evgeni always declines. Finally, the time comes when he is able to compete again, in the 2003-04 season. Once the press start asking him questions about his absence, he is horrified and appalled at the rumors that the press had been spreading about him since his captivity: they said that he was a drug addict and in a secret rehabilitation facility in Switzerland. Evgeni is too traumatized to speak the truth about his captivity, but doesn't have a reasonable explanation for his absence aside from the truth. This added stress only serves to torment him further. In the summer of 2004, Evgeni is on tour with "Golden Blades" when he receives news that Aleksei had a stroke. Evgeni longs to go to St. Petersburg immediately to be with him, but something prevents him from going (NOT SURE WHAT...). About a week or so later, Evgeni is devaststed to learn that his father has passed away. This news breaks Evgeni's heart, and he slips into a deep depression. He reflects on the relationship they had, how he never kept any secrets from him... and then he realizes that there was an experience he blocked out of his mind. It is a repressed memory of his first coach, Leonid Tartarov, and how he abused him mentally, physically, and even sexually for years without Evgeni telling his father or anyone else about it. (This little detail will actually not be revealed in this book; that is to be revealed in the following one). To rid himself of the pain from these repressed memories, Evgeni slits his wrist. Liam finds him barely alive and bleeding on the floor and rushes him to the hospital. There, Evgeni asks Liam to get his local priest before the medical personel begin to work on him. Evgeni manages to recover, and yet he still won't speak of Tartarov's abuse. Liam assumes the suicide attempt was out of grief, and Evgeni does not do or say anything for Liam to think otherwise. As Evgeni struggles to get his life and career on track, he is shocked to see Ekaterina with their child visiting him. Katya tells him that she couldn't stay with Nikolai anymore. His parents kept pressuring them to have children of their own, and Katya could never make love with someone she did not love. Nikolai kindly allows her to get a divorce, and she comes home to Evgeni, asking if they can live together, as they had always wanted to. I have read your story. It was difficult for me but interesting, like watching TV. I have been advised by Russian friends to change it to a more realistic surname. Until I can think of one or receive suggestions, I'll stick with the one I have, then replace it in the editing process. I can suggest Prohorenko, Petrenko, Pavlenko, Panchenko. Is there any aspect of the story that you think needs work? The book is nowhere NEAR finished, but I am so proud of winning, and for laying the foundation to what I think is a wonderful story inspired by our great Tzar of the ice. I hope to edit and add more in January, and when it is finished, I will happily offer the file to those who would like to read it. I would appreciate serious critiques and feedback if anyone is interested. I want this novel series to be something that Evgeni, and his fans, and Russians, and non-Russians, will enjoy and learn from. I couldn't have done it without the encouragement of my boyfriend, who is also a Plushy fan. He pushed me that last day when I had over 10,000 words left to write. When I felt like giving up, I remembered our Zhenya. He never gives up, so why should I? If he can come back from a back injury to do what he did in the Team Event in Sochi, then I can certainly write 10,000 words in a day! And I did! "Frozen Tears" now has a great foundation to build upon. I even have some nice little subplots to develop, and unexpected character relationships to work on as well. I will keep all of you posted on the progress!